Now that we make all of our own personal care and beauty products, I keep a lot of the ingredients on hand in bulk (from here). I looked at the numbers from last year, and we actually saved (a lot of) money doing this! Natural ingredients cost more up front but saved us money in the long run because they are versatile and can be used in multiple recipes and because not as much is needed for natural products. I order these products once or twice a year at most and we have smooth, healthy skin all year! 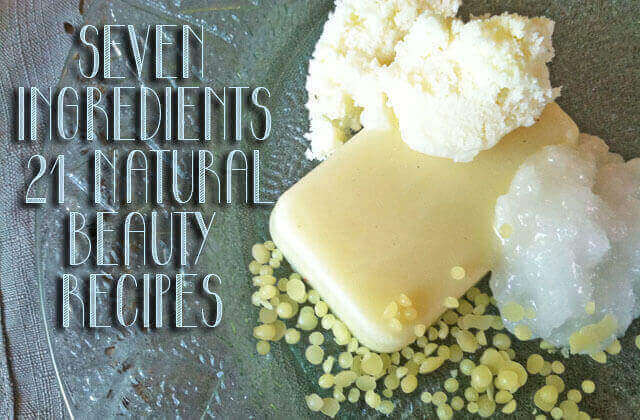 These seven products are my natural beauty staples… (There’s a list of recipes I use them in below!) If you’re just starting out with DIY beauty products, these are great to have on hand and you can make many, many recipes with just these ingredients! We will only use Unrefined, organic coconut oil in cooking, but a cheaper expeller pressed oil could be used in skin recipes to save money (though by ordering in bulk, we still get the good stuff for cheaper than the expeller pressed in the long run!). For those sensitive to coconut, grass fed organic beef tallow can also be used and it is great for the skin, though you will need to add essential oils to cover the mild scent. We get our tallow in five gallon buckets here. Our most used natural beauty ingredient after coconut oil. Organic unrefined shea butter has a naturally nutty, earthy smell (very mild) and is incredibly nourishing for the skin! I’ve heard many cases of children seeing improvement from eczema from usingshea butter or a mix of it and coconut oil. It has natural antibacterial properties and is great for preventing stretch marks, for wound healing, and as an anti-aging treatment for skin. It naturally has an SPF of about 5 and can be used as a daily sunscreen. I use shea butter in my lotion, lotion bars, deodorant, face cream, baby lotion, diaper cream and many other recipes! Cocoa butter is another “butter” and a great addition to natural beauty recipes. It is also an ingredient in organic homemade chocolate (recipe soon!). It imparts a delicate chocolate scent, and I love it mixed with mint or citrus in lotion bars, lotion or face cream. It can be used interchangeably with Shea Butter, though I find that my favorite recipes include Shea butter, Cocoa Butter, and Coconut Oil. Beeswax is a great natural thickening agent, and high quality versions have a gently honey sent. (Note: I’ve heard from several readers that brands ordered from other sources had a very strong and off-putting odor and I can only vouch for this brand.) I use beeswax in lotions, lotion bars, baby care recipes, lip balm, foot cream, etc. Only a little is usually needed to thicken recipes, and a pound lasts us for at least six months. Recipes like smoother lotions, baby oil, salves, and after-shave balms often need to be thinner than coconut oil and the butters will allow. In these cases, I use a liquid carrier oil. Most often, I use olive oil, almond oil, or apricot kernel oil (my favorite). Apricot Kernel has the most gentle scent and almond oil is also relatively unscented. Olive oil is typically the least expensive if you don’t mind the olive scent in your recipes or if you plan to cover it up with essential oils. I keep Arrowroot on hand for thickening sauces when cooking and it also gets added to a lot of natural recipes like deodorant, baby powder, diaper cream, dry shampoo, etc. It works much like cornstarch but isn’t GMO like many corn products. I also use it in my homemade makeup recipes. I’ve only used this brand, and others have reported that brands from elsewhere are often not as finely ground and don’t work as well in skin recipes. Not technically needed, but essential oils give great natural scents to DIY beauty recipes and can also be very mood lifting. I get mine here in 8 ounce or larger quantities and they last literally years. Our favorites are mint, lavender, lemon, orange, and sandalwood. Sugar: Not to eat but great for sugar scrubs! Liquid Castille Soap: for cleaning/washing and for homemade baby wipes.